It may be that Hotmail is a joke (you all side-eye those co-workers that spout off a Hotmail address and prepare yourselves for the old lady forwards you’re destined to be barraged with) in these days of Gmail, but at one point Hotmail was the email provider to have. If you were online in 1996, chances are you had a few free Hotmail accounts (hey, we had to finance our free GeoCities accounts somehow! 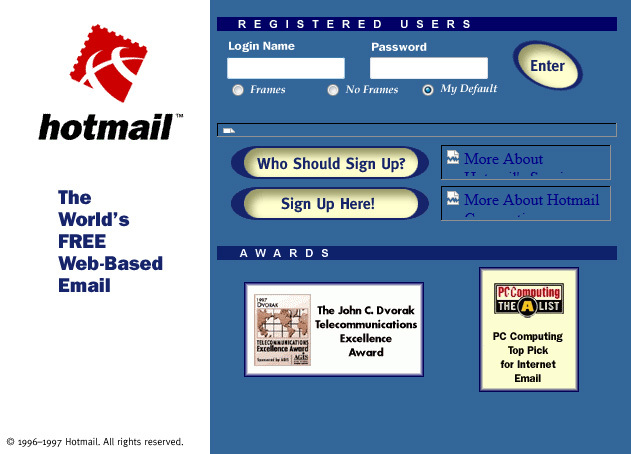 )– they were the first free web-based email service, after all. Before that, you had to fire up Eudora from your home computer. There was no dragging your cinder block of a computer to Starbucks to reply to email in those days. 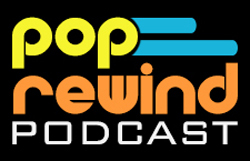 Accessing your email anywhere on any computer was mind-blowing for me. This was a definite game-changer for someone who had to use Eudora and share a POP mail account with her uncle. Things got weird. 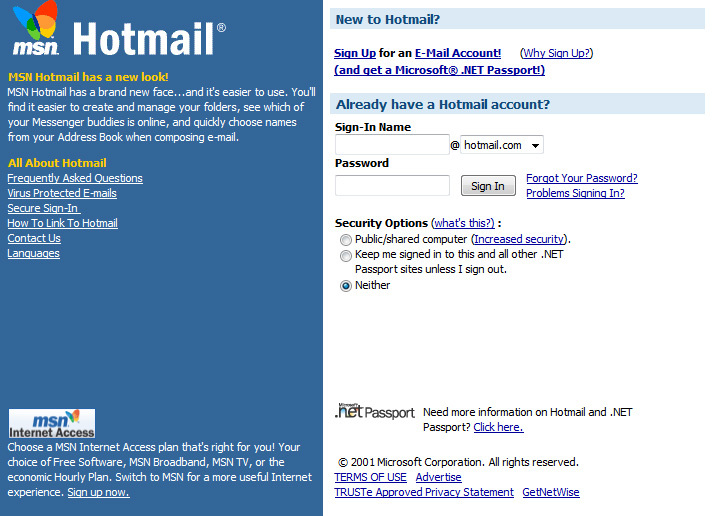 I also remember the day I found out about Hotmail from a classmate. When I got home that day, I asked my uncle (the house’s Internet expert, I guess) if I could sign up for one. He seemed very skeptical, but did his research and allowed me to sign up. The accounts didn’t hold much email. 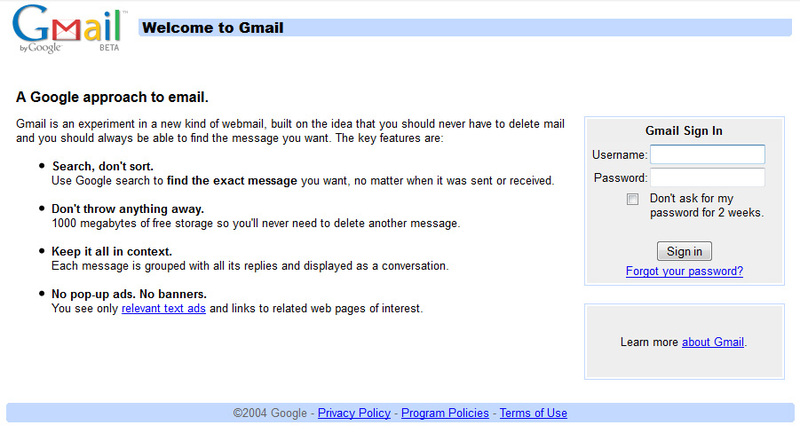 You were looking at 2MB instead of the… I don’t know, I think I’m up to 15GB in Gmail? Email didn’t get saved very often and sent messages didn’t get saved as a default like they do nowadays. You may have forgotten that Hotmail was once stylized as “HoTMaiL”. HTML. Get it? Internet jokez. And you better believe that logo is a gif! It was the Internet in the 90s, everything was a weird gif! 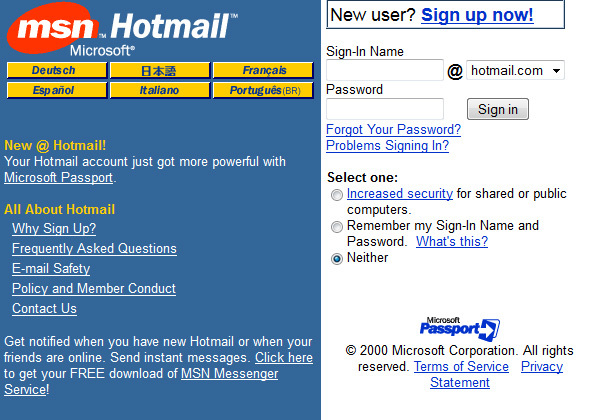 In 1997, Hotmail became MSN Hotmail and later Windows Live Hotmail, where it enjoyed a long life of being pre-installed on computers everywhere. 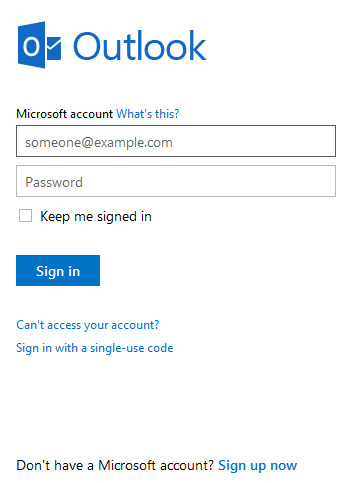 Hotmail began evolving little by little, offering increased security unless someone could guess your security question and then it was a free-for-all. The colorful butterfly on the Hotmail page came about later in 2000. MSN kept pushing its services on Hotmail users. 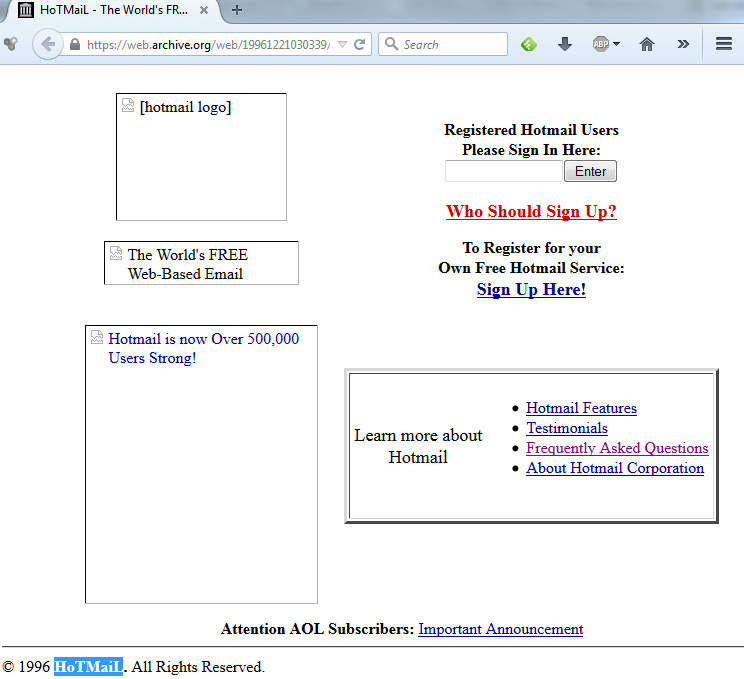 They removed the “free” part in their Hotmail copy and added a blurb about MSN Internet Access. Did anyone ever sign up for this? After that MSN really took over with their Passport.com malarkey and soon enough it was 2004. Visiting Hotmail.com these days brings you to Microsoft Outlook mail, also a service I do not use, but I’m sure it’s lovely. 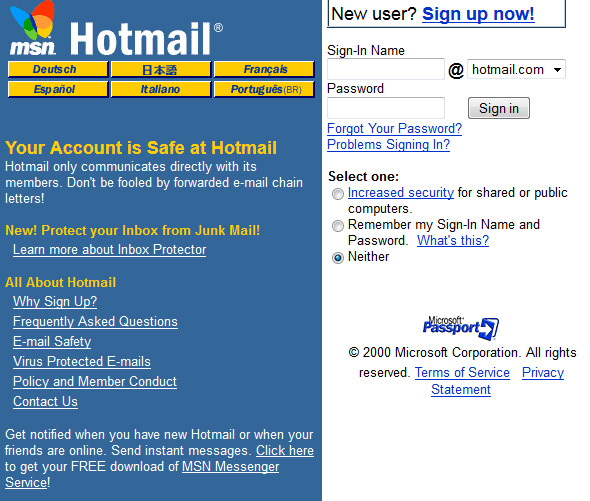 What was your first Hotmail address?